Historically, most of Wythenshawe Park lay within the Cheshire township of Northenden (or Northen.) 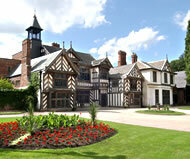 The park we know today was developed from the Wythenshawe demesne, land directly associated with Wythenshawe Hall. From the late 1300s Wythenshawe descended through the Tatton family, who established their residence at Wythenshawe Hall. The most dramatic incident in the Tattons' long history at the hall was over the winter of 1643-44 when the site was besieged by Cromwell's parliamentarian soldiers during the Civil War. Robert Tatton, a royalist, kept the Hall in a state of defence but surrendered on 27 February 1644 after two cannons were brought from Manchester. The site developed over the years, with various additions and changes to the hall and its outbuildings, including a walled garden, glass houses, and an ice house. By 1830 a number of fields around the Hall were opened out to create an area of parkland. By this time the Northenden part of the park also included a number of plantations managed by the Tatton's estate. The hall and parkland was bought in 1926 by Lord and Lady Simon at a time when Manchester City Council was developing Wythenshawe as 'The Garden City', providing new housing for families being moved out of the then deprived areas of the city. It was given to the city, 'to be kept forever as an open space for the people of Manchester,' and was intended for the recreational use of people living on the newly built Wythenshawe housing estate. Since that time the park has been a place of recreation, learning and enjoyment for the people of Manchester.